Don’t want to upgrade to Windows 10? Try Never10, by Steve Gibson. – Providence Computers – "The advice you need, from the guys you know." 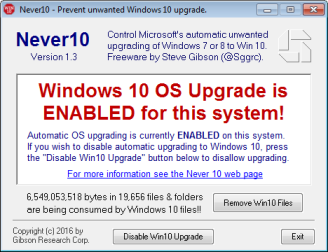 If you are one of the many people who don’t want to upgrade to Microsoft’s new Windows 10 Operating System, try Steve Gibson’s Never10 utility. Small and simple to use, just download and click the “Disable Win10 Upgrade” button.